Non-woven cotton Sling Bags! Our personalized sling bag is a great addition to the vacation accessories. 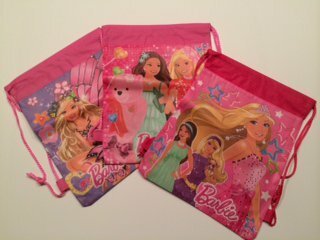 Kids can carry their beach towel and toys in their favorite cartoon character or super hero, personally monogrammed sling pack. These bags also make the perfect Birthday Party Favors or goodie bag. Fill them with toys, puzzles, and candy and present them to your guest at the end of your party in appreciation for their coming out to celebrate your big day. Having the bag personalized is an added touch that will remind folks how much you appreciate them. Please remember to include the "NAME" to be embroidered and your font selection with your order. Thank You.